Dominos Stuffed Garlic Bread Without Yeast – A popular Dominos delicacy that you can now prepare at home BUT without the hassle of using yeast! Dominos, McDonald, Pizza Hut etc. are some of the most popular food joints around the world. People love eating at these places. They have one or the other favorite dish (at these joints) and no matter how many times they go to these food joints, they end up ordering their favorite food item only. Coming back to Dominos, one of the famous food items on their menu is Stuffed Garlic Bread. I am also a big fan of their stuffed garlic bread. That’s why, I decided to try this recipe at home. So, I gathered all the ingredients. I had all purpose flour, sweet corn, mozzarella cheese, mixed herbs and the other ingredients. But when I finally started working on the recipe, I realizes that I didn’t have yeast. After thinking for a minute or two , I decided to experiment with this recipe without using yeast. So is it possible to make Stuffed garlic bread without yeast? Yes, you heard it right. It is possible to make Dominos style stuffed garlic bread without yeast. I made the dough using all purpose flour, oil, baking powder and baking soda, curd and salt. The simple science in this recipe is that curd + baking powder + baking soda , here do the work of yeast. How to make the dough for Dominos stuffed garlic bread (without yeast)? We will take curd in a small bowl. Remember to use thick curd. You can either put the curd in a sieve. Place a bowl under this sieve and leave this set up for at least 4-5 hours. The end result would be thick curd. Or do one thing – Use ready made curd. The one we get in small cups. That’s usually thick and is of the exact consistency as this recipe requires. Now add baking powder and baking soda into the curd. Mix nicely. Cover this small bowl with a small plate. Leave this mixture for five minutes. You will see that after five minutes, there will be bubbles in the curd mixture. This will make our stuffed garlic bread tasty and will do the work of yeast. The next step is to add all purpose flour, oil, mixed herbs and salt into this curd mixture. Mix nicely till you get a nice dough. You might have to knead this mixture for two to three minutes to get a smooth dough. Unlike the yeast recipe, this recipe does not require us to leave the dough for one hour or more time. Thus we can also call this recipe an Instant stuffed Garlic Bread recipe. How to make the filling for Dominos stuffed garlic bread (without yeast)? The filling is the same as that of Dominos stuffed garlic bread. We will use sweet corn, grated mozzarella cheese and mixed herbs. We will also apply a butter mixture on the base of our Dominos stuffed garlic bread for an extra flavor. For making the butter mixture, melt butter in a small bowl. Add chopped garlic and red chili flakes. Mix well. The butter mixture is ready! W will roll out the dough into a round shape. Then we will prick the dough using a fork. Then we will apply the prepared butter mixture. Then we will add sweet corn, mozzarella cheese. We will also sprinkle some mixed herbs on the top. Now fold this. Seal the edges with the help of a fork. Apply some melted butter (You can also use the left over butter mixture) and sprinkle some mixed herbs. Make some vertical cuts on the brea. The cuts should not be too deep. (See the picture above). We will bake this Dominos stuffed garlic bread in an oven at 180 c / 350 F for 10-12 minutes. You can serve this Dominos stuffed garlic bread with mayonnaise. This tastes great with mayonnaise. You can prepare this Dominos stuffed garlic bread for evening snack or maybe for a Sunday special brunch. You can also prepare Dominos Style White Sauce Pasta or Pasta in red sauce with vegetables, for a complete fun meal. Now let us see the recipe. 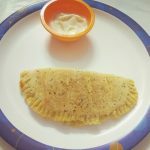 Do try this recipe and let me know how it turns out for you. 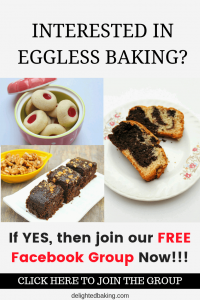 If you have any questions regarding the recipe, then feel free to ask them in the comments below. Dominos Stuffed Garlic Bread Without Yeast - Prepare this popular Dominos delicacy at home now BUT without the hassle of using yeast. In a bowl and curd. Also, add baking powder and baking soda. Mix well. Leave this mixture for 5 minutes. Add oil. Also, add maida (all purpose flour) and salt. Make a dough from this mixture. In a small bowl add melted butter, chopped garlic and red chili flakes. Now roll out the dough. Make some holes with the help of a fork. Apply the butter mixture. Add sweet corns . Add grated cheese. Sprinkle some mixed herbs and fold this. Seal the edges with the help of a fork. Apply the butter mixture and make some vertical cuts using a knife. Sprinkle some mixed herbs. Bake at 180C / 350 F for 10-12 minutes. Dominos stuffed garlic bread without yeast is ready!